Lloris (5.1) is our man between the sticks this week after putting up an excellent display against the Saints last week that saw him pick up 2 bonus points. Though Spurs haven’t managed many clean sheets off late, their fixture against Norwich shouldn’t be too hard to secure one. Alternatives: West Ham’s Adrian (5.0) has been in the form of his life with three clean sheets in his last three games. With bottom placed Villa as their opponents this week, it looks like a sure shot formula to make it 4 in 4. Cresswell (5.5) and Sagna (5.5) are automatic picks for this week, as they take on the bottom two, Villa and Sunderland respectively. Arsenal’s Bellerin (5.9) has an easy run of fixtures on the horizon starting off with an out of form Saints side this week. Southampton have failed to score in their last 2 matches, and will find it hard to score against an in form Arsenal side at home. Our last two picks, Dann (5.4) and Simpson (4.0) remain unchanged from GW17, with Palace taking on Bournemouth at home and the budget friendly Leicester defender facing off against Liverpool on the road. Alternatives: Spurs’ Alderweireld (5.9) is an excellent alternative for this week, as he faces off against Norwich at home. Another budget friendly (yet risky) alternative is Watford’s Nyom (4.7) who has astonishingly picked up 3 clean sheets in his last 3 games. Mahrez (7.1), or the Algerian Messi as we like to call him here at FFT, is ofcourse our first pick in midfield. He has picked up 6 goals, 1 assist and 9 bonus points to rack up a whopping 39 points over the last three weeks. Next up is the in form London based duo of Ozil (9.9) and Alli (5.2) who have picked up 2 goals and 5 assists among themselves in the past 3 weeks. They face off against easy opposition in GW18, and will be sure to find themselves on the scoring / assisting charts this week. Our next pick in midfield is Barkley (7.5) who picked up two assists last week in their clash against the table toppers Leicester City. This week he faces off against Norwich which should give him plenty of opportunity to rake in some good points for us. Finally we wrap up our midfield 5 with the out of form De Bruyne (10.8). Though he has drawn a blank in his last three games, we have complete faith in him to bring in the points against Sunderland this week. Alternatives: Yaya Toure (8.5) offers a cheaper option into City’s attack, and can be a good alternative after picking up a goal and assist in his last three games. A differential option to look out for is Chelsea’s Willian (7.0) who picked up two assists last week, and will face off against Watford at home. The in form pair of Lukaku (9.3) and Vardy (7.7) lead the line again this week too, as they take on Newcastle and Liverpool away from home. Both have consistently picked up more than 5 points in each of their last 5 games, and look to be nailed on for a while seeing the form they are in. Finally, we bring in Kane (9.7) this week, after he picked up his 9th goal last week after a 3 game drought. Spurs take on Norwich this week, which will give the young Englishman a lot of chances to get on the score sheet. Alternatives: Giroud (9.1) has slipped under the radar due to all the hype around Vardy and Lukaku off late and it would surprise you to know the striker has slyly picked up 4 goals in his last 5 games. 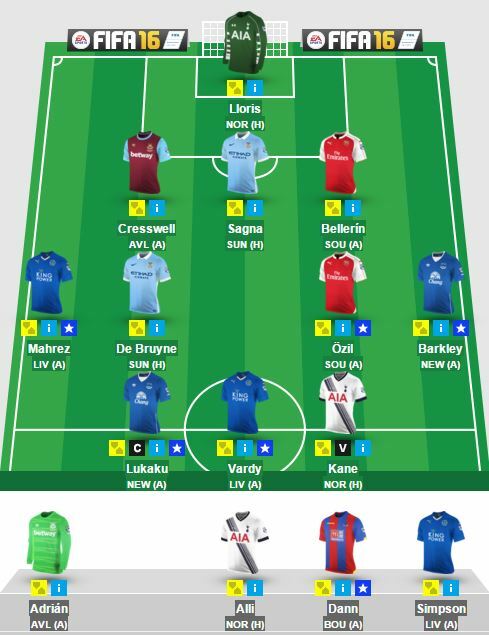 Another option, though quite expensive, is to bring in the fully recovered Aguero (13.1) back into your teams. We all know the kind of damage he can do, but for now we think a spot in the alternatives should suffice for the time being. This entry was posted in General, Squad and tagged english premier league, EPL, Fantasy Football, fantasy football squad, fantasy football tips, fantasy football transfers, fantasy premier league, football transfers, FPL, Gameweek 18, GW18, Transfer Tips. Bookmark the permalink.